A new Bronx jail is coming to Mott Haven thanks to Mayor Bill de Blasio. Currently an NYPD tow pound lot, the site at 320 Concord Avenue is the location of the old Lincoln Hospital. This is part of the 10 year plan to shut Rikers Island down and build jails in each borough and was first announced by former NYC Council Speaker Melissa Mark-Viverito as part of her campaign on criminal justice reform. The move to shut down Rikers and create smaller, safer jails is part of that plan. Already Rikers Island’s first jail is closing this summer, the George Motchan Detention Center which houses 600 men. 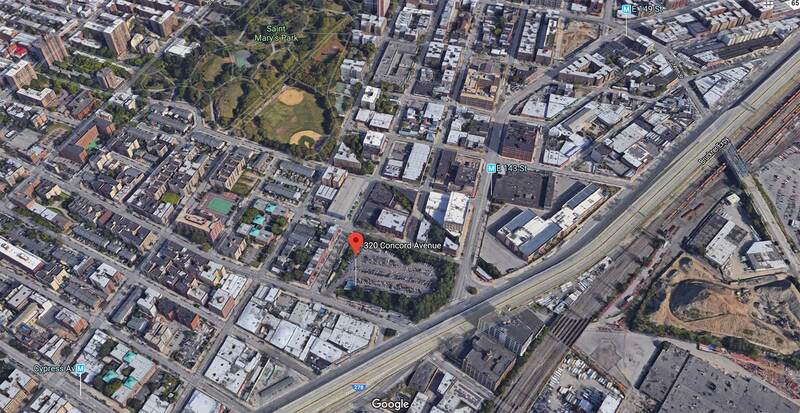 “The new facility will be opened at 320 Concord Ave. in the Bronx’s Mott Haven neighborhood, according to a person familiar with the proposal. This person said the building most recently has been used by the New York Police Department and that it would have to undergo renovations to be used as a jail. Mr. de Blasio, a Democrat, promised to close the jail complex at Rikers Island after years of pressure from criminal-justice advocates, elected officials and others who said the aging facilities were dangerous and beyond repair. Some of those advocates, including former New York state Chief Judge Jonathan Lippman, have said the mayor’s 10-year timeline is too long. Building new jails likely will require getting the buy-in of local elected officials and could face community opposition. The proposed site of a new Bronx jail in Mott Haven as part of the plan to close Rikers Island within a decade. Notice the proximity to St Mary’s Park. The proposed location on Concord isn’t the best site for this however. The site is located in a residential neighborhood and proximate to several schools. This is especially relevant given the amount of push back communities are bound to give due to the location. Therefore, if we’re going to build jails in the outerborough, they should be placed far from schools and residential areas. As a result, the city should make a better effort to build a Bronx jail away from such a neighborhood and perhaps deep in an industrial area. Can Spanish-Speaking Courts Speed Up Trials in The Bronx and Save Money?